Electric vehicles may be the future, but oil is the present, and so long as the world runs on its production and sale, it’s a commodity that we’ll monitor. We’ve laid out our thesis on oil before: In a nutshell, shale oil, with its ever-decreasing break-even costs, has established a long-term ceiling on prices. That’s bad news for countries that depend on oil reserve for government revenue, especially Saudi Arabia and Russia. But oil prices are now at highs not seen since 2014. Iran and Israel have exchanged blows in Syria, spooking the market in the process. And two of the world’s major oil producers, Venezuela and Iran, are facing domestic unrest (Venezuela) or domestic unrest and foreign threats (Iran) that put their ability to produce and export in doubt. We’re still not in the business of forecasting commodity prices, but given these developments, it’s time for us to revisit our thesis. In this Deep Dive, we’ll expand upon two ways to analyze oil prices: fundamentals, as determined by supply and demand, and premiums generated by sometimes ambiguously defined uncertainty in oil-producing parts of the world. This should help us answer a fundamental question: If prices stay high enough, long enough, what would it mean for Russia and Saudi Arabia, two major countries that need the capital to transform their economies and militaries? 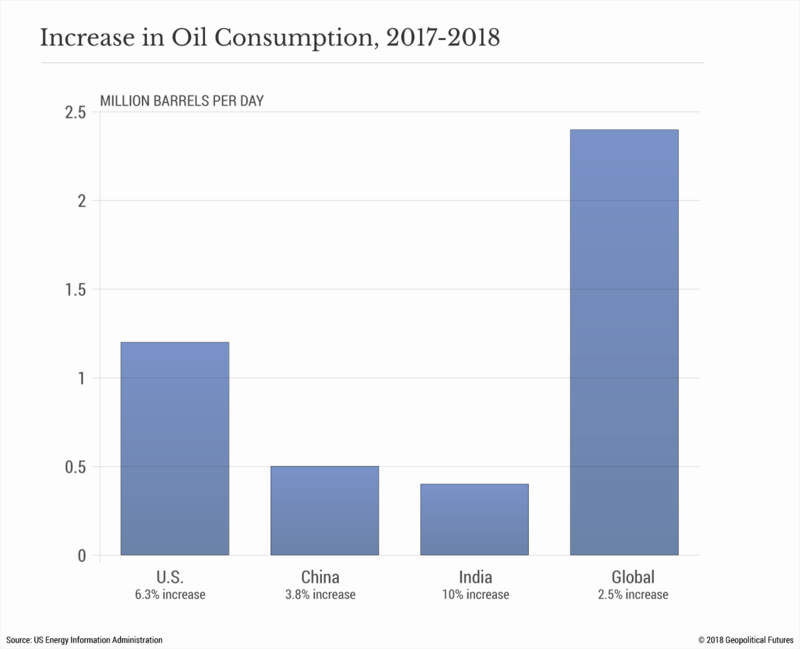 Global oil consumption has outpaced production since the beginning of 2017, a result of lower supply due to OPEC cuts and a dip in U.S. production. (The low oil prices of 2015-16 drove many U.S. shale drillers out of business and forced others to forgo drilling at wells with higher break-even points.) 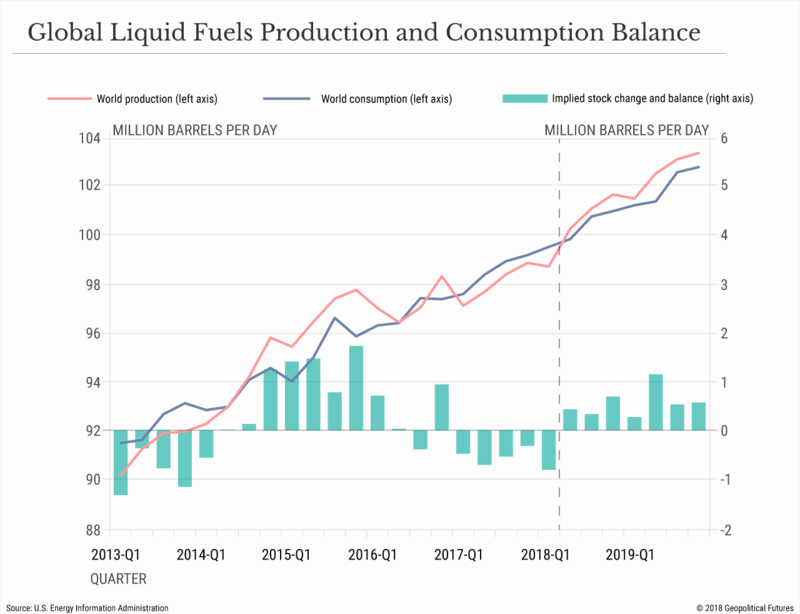 In the first quarter of 2018, global consumption stood at 99.52 million barrels per day, and production was 98.71 million bpd. The U.S. Energy Information Administration does not expect this trend to last, however. This is in part because U.S. shale oil production is on the rise again, a topic that will be discussed in greater detail below. Consumption has also grown, primarily because of greater demand in North America and Asia – especially China and India. The net effect has been a decline in global inventories, which have fallen to 20 million barrels below the five-year average, a figure that OPEC uses to gauge its level of supply. The trends are established and clear, but two situations could upset the balance: the effective termination of the Iran nuclear deal, and the quasi-anarchy in Venezuela. We’ll look at both in turn, but ultimately the amount of oil production at stake is not enough to radically decrease the global supply long enough to create a serious shortage. Iran produces some 3.65 million bpd of crude oil and exports 2.4 million bpd. Some sources estimate that the reimplementation of sanctions could cut its exports by 1 million bpd. This time, however, the sanctions lack a united front, and some countries are looking for creative ways around them. One of Iran’s biggest customers, India, has effectively said it does not plan to stop buying Iranian oil, sanctions or not. Almost half of all Iranian oil exports go to China and India, so for the sake of establishing a baseline estimate, let’s assume that Iran’s production declines by 50 percent, from 2.4 million to 1.2 million bpd. Venezuela produced approximately 1.4 million bpd of oil in April 2018. 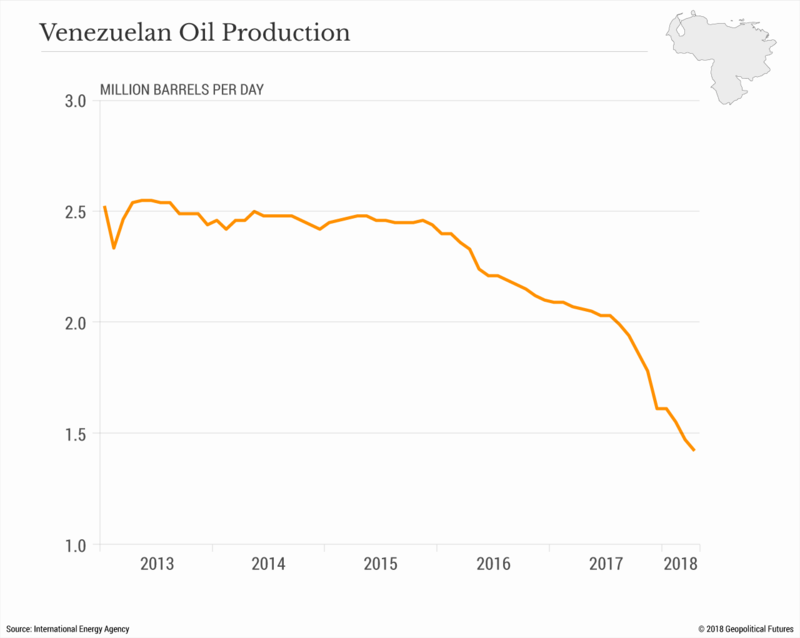 This represents a 32 percent drop from last April, and some reports anticipate that, with its domestic unrest and its decrepit machinery and production facilities, Venezuela’s production could fall by another 500,000 bpd. Together with Iran, that means a roughly 1.7 million bpd decline in global oil production is possible within the next year. Now that we have an estimate of the potential losses, to truly gauge the effect on prices we need an estimate of potential production increases. And one of the regions that is poised to increase oil production most rapidly is the United States. The U.S. produces approximately 10.7 million bpd of crude oil, about 84 percent of which comes from shale. (The remaining 1.65 million bpd comes from offshore drilling in the Gulf of Mexico. This is the most the Gulf has ever been recorded producing, and that figure is expected to increase through 2019.) Global production of liquid fuels (all liquid petroleum products, which include crude oil and refined products) is expected to rise by 4.67 million bpd between April 2018 and December 2019, according to the EIA. Increases in U.S. production will account for about two-thirds (roughly 3.11 million bpd) of this growth, followed by Canada (650,000 bpd) and OPEC (330,000 bpd). Total OPEC crude oil production is actually expected to decrease by 80,000 bpd over this time, but liquid fuels production is projected to climb by 410,000 bpd. 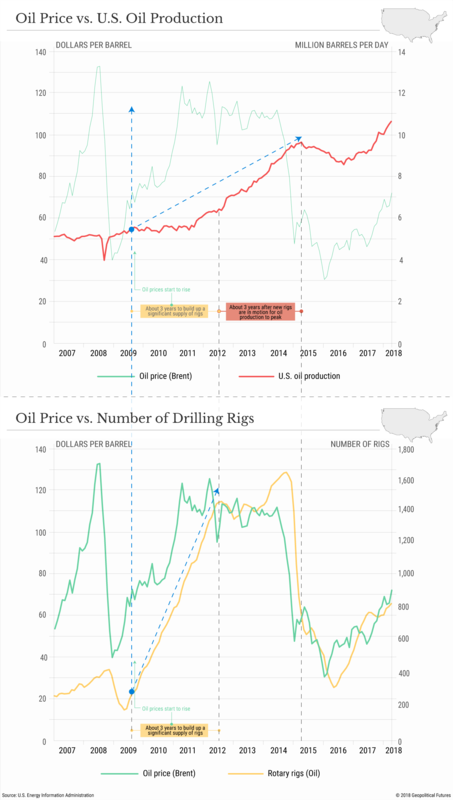 Because of the rise in oil prices, more rigs are being deployed in the U.S. to drill new wells. Historically, it has not taken long for U.S. shale producers to drill more wells when prices increase. And once new rigs are in motion, it doesn’t take long for oil production to climb. That said, the U.S. faces short-term obstacles that will limit how quickly it can increase production, the most substantial of which is that U.S. pipelines are almost at capacity and are expected to max out by mid-2018. In lieu of pipeline transport, producers of Permian and Midland crude have had to use rail or road transport. (Road is more expensive than rail, which is more expensive than pipelines.) Delivery delays and the increased transport cost force producers to offer their crude at a discount, reducing the price of Permian crude by nearly $11 per barrel and of Midland by up to $16 per barrel. These constraints won’t last. A substantial amount of investment capital has been pouring into oil transport infrastructure in the United States. Petrochemical Update, a publication that covers the downstream industry, estimates that nearly $11 billion will be invested in pipeline infrastructure construction between May 2018 and May 2019 alone. The result will be a major increase in pipeline capacity by the end of 2019. Three of the largest pipelines under construction – Cactus II, Gray Oak and Epic – will add another 1.9 million bpd in transport capacity in the U.S. by the end of next year. Other estimates expect even more capacity – up to 2.5 million bpd – to be added over the same period. Meanwhile, the EIA projects U.S. crude oil production to grow from 10.7 million bpd to 12 million bpd by the end of 2019. In other words, based on the new pipeline capacity estimates, transport constraints should effectively be eliminated for new production by then. It is worth noting that the EIA has often underestimated how much U.S. shale oil production will increase. 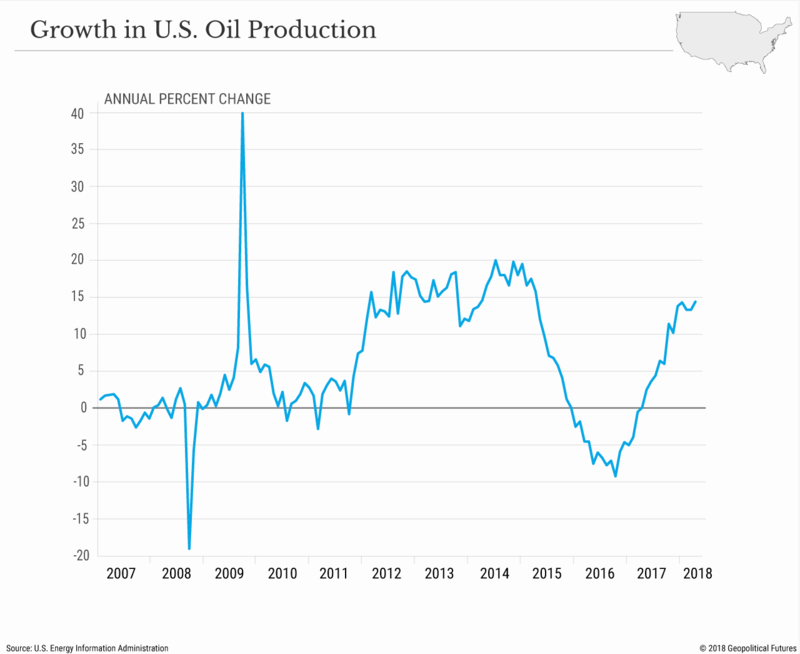 Since 2010, historical growth in U.S. oil production has regularly been above 10 percent annually (and up to nearly 20 percent in a couple of years). The only time U.S. production experienced a sustained decline on an annual basis was during a period lasting a little over a year from late 2015 to early 2017. Past performance does not guarantee future results, but 10 percent annual growth for another two years would put U.S. production at closer to 13 million bpd by mid-2020. What this means is that the growth in U.S. production alone should be enough to compensate for the potential lost production from Venezuela and Iran by the end of 2019. And this does not even account for increases elsewhere. Inventory levels in Organization for Economic Cooperation and Development countries have fallen below their five-year historical averages – a figure that OPEC often uses to gauge whether to cut or increase supplies – which means OPEC may also increase its supply of oil to the market in 2019. Besides transportation issues, the other notable constraint on the growth of U.S. production is break-even prices. All this new oil pouring into the market should push prices down, and at a certain point it is more expensive for producers to extract the oil than it is for consumers to buy it, leading producers to stop extracting. But for U.S. shale oil, break-even prices continue to decline, due in part to technological advances that have increased the oil yield per new well drilled. 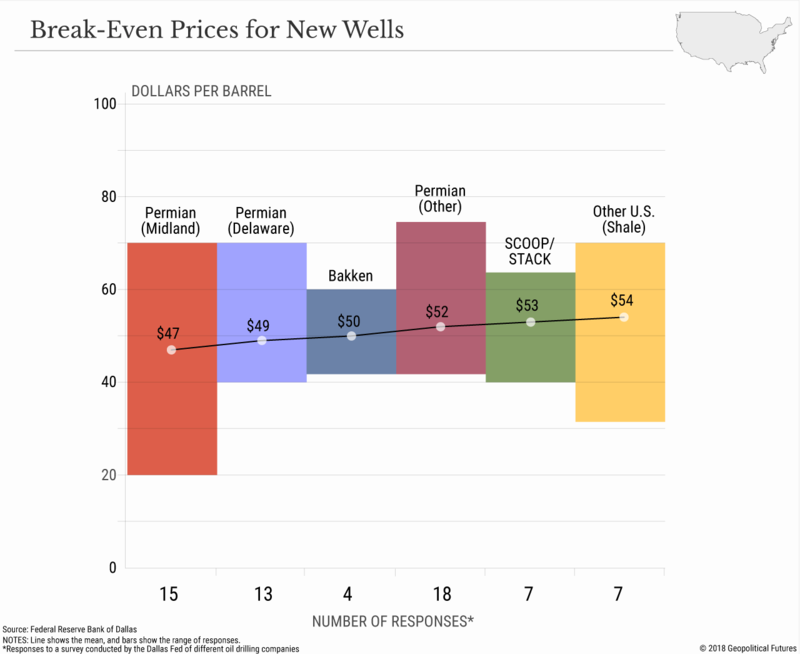 Though break-evens vary widely depending on the region and company, several U.S. locations have average break-even prices of $45-55 per barrel. For Saudi Arabia and Russia, the world’s other top producers of crude oil, the calculus is much more complicated than break-even prices. Saudi Arabia can produce a profitable barrel of oil for around $10-15, but its political needs go far beyond profit. To be able to continue supporting its social programs and subsidies, Saudi Arabia must generate enough profit to balance its fiscal budget, and its fiscal break-even price per barrel is far higher – around $84 in 2017, according to the International Monetary Fund. Russia claims that its fiscal plans are based on a price of $40 per barrel, but our own estimates place its fiscal break-even higher, closer to $70 in 2016. The key difference between Russia and Saudi Arabia compared to the United States, however, is that when oil prices fall below the break-even point of production in the U.S., the oil industry becomes less profitable; when oil falls below the fiscal break-even price in Russia and Saudi Arabia, the fates of the countries’ regimes are at risk. Though it is possible to make coherent predictions about the balance of supply and demand for oil, it is far harder to guess how markets will react to a particular development. Uncertainty worries markets, and when events in oil-producing regions increase uncertainty, the price of oil goes up irrespective of supply and demand. This is often vaguely described as “geopolitical risk.” The reinstitution of sanctions against Iran and the chaos in Venezuela are geopolitical risks, but the impending increase in production from the U.S. can match those countries’ contributions to the global supply. The place where it could go awry – the true geopolitical risk – is Saudi Arabia. Saudi Arabia is the largest oil producer in the Middle East. Any situation that disrupts the production or export of Saudi oil – whether due to unrest inside the country or conflict outside of it – would increase oil prices. The likeliest of these highly unlikely scenarios is a military coup. Since Mohammed bin Salman was named crown prince last June, a rift has been widening between his reformers and religious conservatives. When heavy gunfire was reported outside the Saudi royal palace in late April, news outlets were quick to call it a coup attempt. (The government said the disturbance was caused by the downing of an unauthorized drone, but doubts remain.) In the event of a coup, oil exports may decline or be shut off for a time but would return quickly after the military regime came to power because it, too, would depend on oil revenues for its survival. Another potential type of unrest would be the complete degradation of the Saudi monarchy. This is very unlikely in the next five years, but if reforms fail and the country’s foreign exchange reserves run dry, it could create a ground swell of disenfranchised young men who are angry at the regime. This would provide an opportunity for the Islamic State or another version of Islamist fundamentalist insurrection to take hold. After all, Saudi Arabia was formed by a religious uprising. If such an uprising toppled the regime or kicked off a civil war, Saudi oil exports would be in doubt. A civil war in particular could hurt oil production for a long time. Were an Islamic regime to come to power, it would no doubt also want oil revenue, but it’s unclear whom the regime would be willing to sell to and which countries would be willing to buy. Then there is the risk of interstate conflict, whether between Saudi Arabia and Iran or just generally in the region, most likely between Iran and Turkey. No one seems ready for war just yet. Saudi Arabia and Iran do not share any borders, although they could always confront one another in Iraq or the Persian Gulf. Iran’s recent backing down from escalations against Israel is one indication that it does not feel prepared to take on another nation-state directly at the moment. Turkey, meanwhile, has enough problems at home with its mounting debt and falling lira. Any confrontation with Iran also risks dragging in the United States. Iran has threatened in the past to mine the Strait of Hormuz if it’s attacked – a move that would hurt Middle East oil exports. This is a deterrent against a U.S. strike, but it is not a particularly convincing one. The U.S. Navy would not tolerate a blockade of the strait and would respond with de-mining operations. 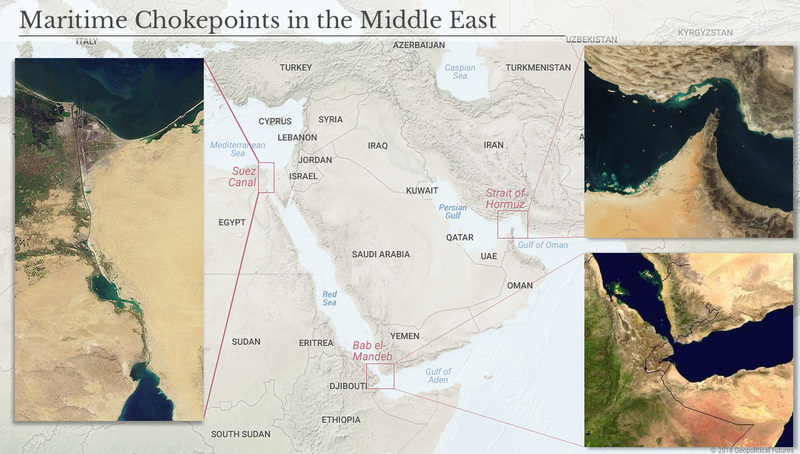 Either way, the strait is not the only path through which Saudi Arabia exports oil – it can also export from the Red Sea through the Bab el-Mandeb strait to the south or the Suez Canal to the north. What really matters, though, is that Iran’s mining of the Strait of Hormuz would invariably spook markets and raise the price of oil, probably substantially. The other threat posed by hostilities with Iran is that Tehran would retaliate by activating Shiites in the region. For example, Iran retains a potent fighting force in neighboring Iraq via its Shiite militias. If Iran were to order its militias to march on Basra or other oil-producing regions of Iraq, it would reignite hostilities in Iraq and decrease the available supply of oil, risking a spike in prices. Iran could also attempt to stir trouble in oil-producing Shiite areas within Saudi Arabia. Each of these events is unlikely, but if one were to occur it would have global implications. For one, if the U.S. were dragged into any sort of confrontation with Iran that forced it to redeploy forces and again get bogged down in the Middle East, Russia would benefit financially from the inevitable bump in oil prices and geopolitically from U.S. overextension. In the event of a Saudi civil war or military coup, the whole of Russian economics would change. Oil prices would stay high for at least as long as the fighting lasted, and possibly longer, allowing Russia to accumulate greater wealth, which it could invest in its own reforms or to upgrade its military. Our forecast on Russia’s decline is based on deep structural weaknesses that go beyond simply the price of oil, but if one of the largest oil-producing countries in the world was taken offline, it would seriously challenge that forecast. Moreover, countries that try to avoid intervening in the Middle East but that depend on Iran or Saudi Arabia for their supply of oil would be forced to make some difficult choices. 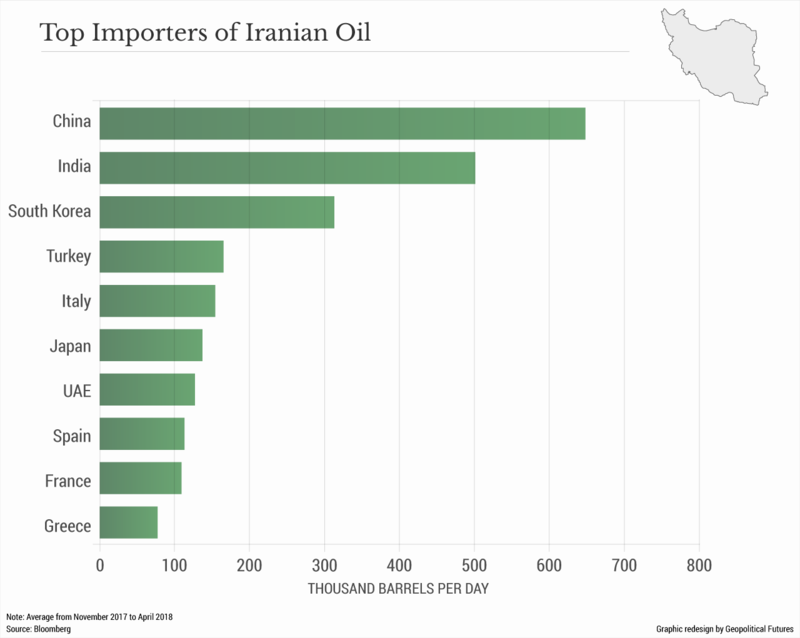 China, India and Japan are all major consumers of Iranian, Saudi and Iraqi oil. A regional conflict that risked shutting down their supply could paralyze their economies. This could be the moment Asia gets involved in the Middle East. Oil prices have reached highs not seen since 2014, but there has not been a fundamental shift in the dynamics of the global oil market. As expected, shale oil drilling and production have already begun ramping up in response to higher prices – so much so that existing distribution infrastructure in the U.S. is nearly tapped out. This has forced U.S. producers in some regions to heavily discount their oil while they ship via road or rail until new pipelines come online in 2019. Once that happens, if Iran and Venezuela are unable to export as much oil as they have been, U.S. production will make up the difference. But pricing oil is more complicated than just looking at market fundamentals. It’s not enough to say that “geopolitical risk” is responsible for higher prices. We’ve mapped out some of the likelier geopolitically risky scenarios, but ultimately, Saudi Arabia should be stable enough not to affect production in the short term, and a prolonged war in the Middle East that severely disrupts exports appears unlikely for now. The markets’ biggest fear is fear itself. — The Crude Math of Geopolitical Risk originally appeared at Geopolitical Futures.